Spacetime dynamics of crowds are proved to be like dynamics of perturbation waves propagating in an excitable nonlinear medium. This analogy is developed further by studying the propagation of excitation—as represented by the two-variable Oregonator model of the Belousov–Zhabotinsky medium—and by then providing a thorough explanatory application study of the dynamics of excitation on Barcelona street networks considering crowd movement. In more detail, two characteristic areas of Barcelona—Gràcia and Raval—recently in the spotlight due to emerging situations, are analyzed in the context of the proposed study. The computer experiments performed show how an excitability of the medium affects the propagation dynamics. It is demonstrated that with decreasing excitability, the spanning of the street networks by an excitation wavefront shows evidence of pruning toward wider and ballistically plausible pathways. It is known that Shannon’s information entropy, compressibility and algorithmic complexity quantify different local and global aspects of synthetic and biological data. Applicability of these concepts to objects closer to the “clinical end” is less studied. A possible approach consists of encoding the state of a human body system represented by its system dynamics model using matrices and monitoring the behavior of the system through analysis of these matrices, with a potential extrapolation of the results to the clinical setting. This paper presents an attempt at using some concepts and tools, specifically the block decomposition method (BDM), coming from the new emerging field of algorithmic information dynamics, for the management of a patient, especially in the intensive care unit (ICU). It describes some aspects pertaining to the “pre-clinical” incipient stage and tries to outline eventual future clinical application. The concept of emergence is a powerful way to explain very complex behavior by simple underlying rules. Existing approaches to producing emergent collective behavior have many limitations, making them unable to account for the complexity we see in the real world. 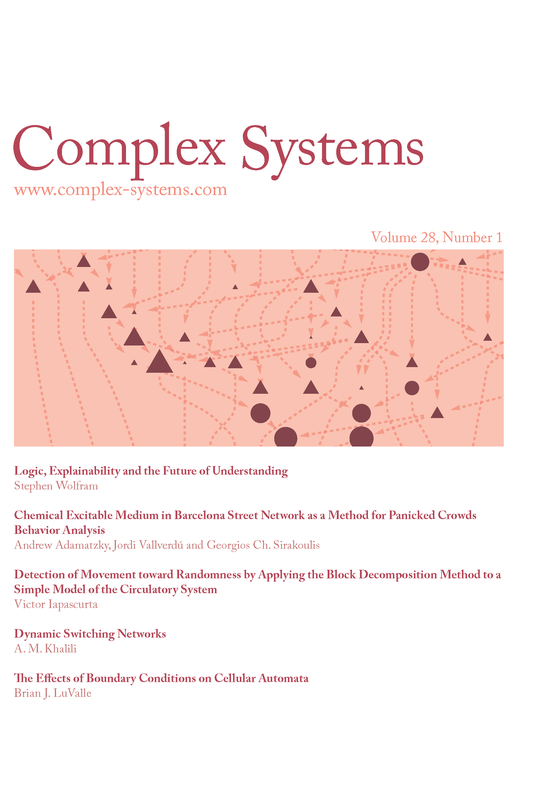 In this paper, we propose a new dynamic, nonlocal and time-independent approach that uses a network-like structure to implement the laws or the rules, where the mathematical equations representing the rules are converted to a series of switching decisions carried out by the network on the particles moving in the network. The proposed approach is used to generate patterns with different types of symmetry. In this paper, we explore how the behavior of cellular automata (CAs) is affected by different boundary conditions and what types of systems it is affected by. Six experiments are presented. The first determines the most effective boundary condition for optimizing rule-output (in)equality related to Shannon entropy. The second experiment determines the effect of the boundary conditions compared to the size of the initial conditions. The third experiment determines the variation of systems for a specific Li–Packard and Wolfram class. The fourth experiment generalizes the principles of the third experiment into a rule space involving four binary cells rather than three. The fifth experiment determines the change in complexity of systems with different boundary conditions. Finally, the sixth experiment generalizes the concepts of the fifth experiment into the same rule space used in experiment four. Most of the time, boundary conditions do not change the classification, thus do not change the behavior. But some boundary conditions have been found to change the qualitative behavior. However, it is only constant boundary conditions that have been found to change the complexity of a system, and the constant boundary conditions only decrease the complexity. The largest change in the compression ratio was found to be for rule 110 when the boundary conditions change from cyclical to constant. The degree of this change is approximately 25%. Distributed and cyclical boundary conditions can be relied upon to maximize the rule-output equality of systems in general, while null boundary conditions can be relied upon to increase the overall complexity of a system.